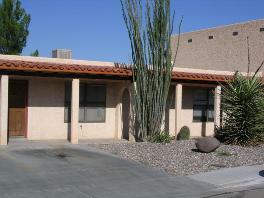 We offer a variety of townhomes and single family homes, located throughout the City of Las Cruces. Below are our current and upcoming vacancies. Select the image to view a slideshow of the inside and outside. Underneath the slideshow is map of exactly where this vacancy is located. 1 bedroom, 1 bathroom townhome. 620 square feet. Apartment is all electric--no gas. Appliances included: stove & refrigerator. There are no washer/dryer connections. Water, sewer, sanitation provided. Resident pays electric.